Martita is a favorite teacher of mine. Her personality, her demeanor, her embodiment of Flamenco dance and music exudes in her whole being; one cannot help but love her. Although I have met her in the early 2000’s and took lessons on and off for months; there were pressing family and personal issues that needed priority more than dancing. And so I stopped. But I cannot stay away from dancing for long. My body needs it. So this year, after immersing myself back into dancing consciousness, I started going back to my dancing teachers for lessons so I can catch up again. And thus, here we are with Martita. Her whole family consists of David and Martita Madeira Woods with their 8 children (all grownup with their own families). Everyone is artistic. They even have their own band named Abakadubi, a fusion of dance and music, according to the description in their website. If you meet Martita and the rest of her family, one can only conclude that they are a closed-knit, one big happy family who want to share to the world their love of music & dance; their selflessness; social and environmental consciousness as well as healthy living. That said, people who meet and befriend them all feel that they too belong to her family. So I told Martita that it’s only my gratefulness that I write something about her and Flamenco. And plug their business and livelihood. Under the Abakadubi umbrella is Martita’s Bailar Dance Studio. She had taught so many would-be dancers from tweens to young and mature adults into graceful, self-confident Flamenco dancers. 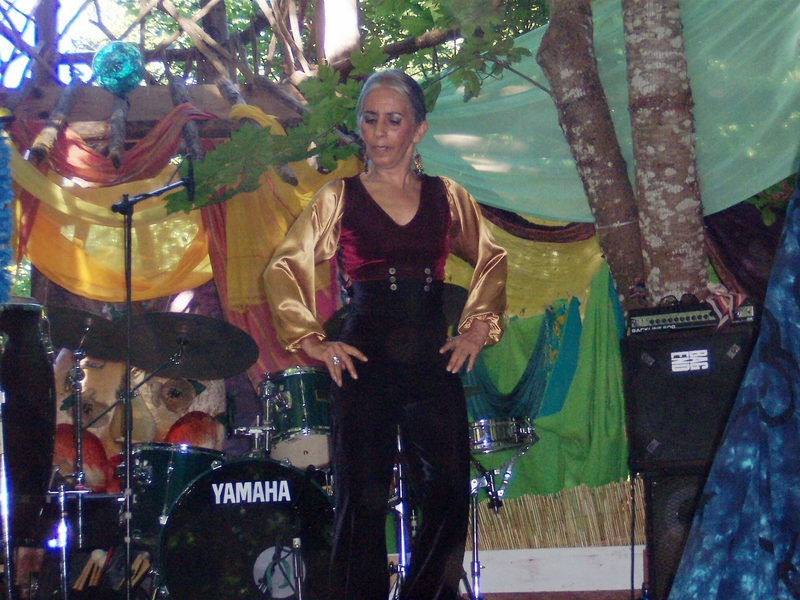 Below are more photos taken from the Oregon Country Fair of Martita, Abakadubi band, of Iana and Ishi who are the singers, poets, spokespersons for the band. Iana was, by the way, a classmate of my son in middle and high schools. Amazing how such a small world we have, that we all meet one another again sometime in our lifetime. Please note some photos are a bit blurry, as Martita and Ian danced so fast; it was hard to capture good movement out of them. And yes, I have a crappy, basic digi camera. What can I say!